The model, however, describes a population in which there is no competition. R is constant, and if R >1, the population will continue to increase in size indefinitely ('exponential growth', shown in Figure 5.18). 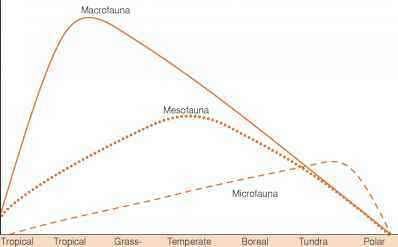 The first step is therefore to modify the equations by making the net reproductive rate subject to intraspecific competition. This is done in Figure 5.19, which has three components. Figure 5.18 Mathematical models of population increase with time, in populations with discrete generations: exponential increase (left) and sigmoidal increase (right). Figure 5.19 The simplest, straight-line way in which the inverse of generation increase (N/Nt+1) might rise with density (Nt). For further explanation, see text. At point B, by contrast, the population size (Nt) is very much larger and there is a significant amount of intraspecific competition, such that the net reproductive rate has been so modified by competition that the population can collectively do no better than replace itself each generation, because 'births' equal 'deaths'. In other words, Nt+1 is simply the same as Nt, and Nt/Nt+1 equals 1. The population size at which this occurs is, by definition, the carrying capacity, K (see Figure 5.7). a hypothetical population increasing in size over time in conformity with the model). The population in Figure 5.18 describes an S-shaped curve over time. As we saw earlier, this is a desirable quality of a model of intraspecific competition. Note, however, that there are many other models that would also generate such a curve. The advantage of Equation 5.12 is its simplicity. The behavior of the model in the vicinity of the carrying capacity can best be seen by reference to Figure 5.19. At population sizes that are less than K the population will increase in size; at population sizes that are greater than K the population size will decline; and at K itself the population neither increases nor decreases. 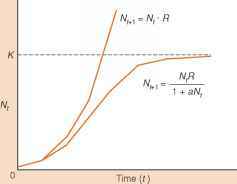 The carrying capacity is therefore a stable equilibrium for the population, and the model exhibits the regulatory properties classically characteristic of intraspecific competition. For further simplicity, (R - 1)/K 5.8.2 What type of competition? This is a model of population increase limited by intraspecific competition. Its essence lies in the fact that the unrealistically constant R in Equation 5.7 has been replaced by an actual net reproductive rate, R/(1 + aNt), which decreases as population size (Nt) increases. We, like many others, derived which comes first - Equation 5.12 as if the behavior of a popa or K? ulation is jointly determined by R and K, the per capita rate of increase and the population's carrying capacity - a is then simply a particular combination of these. An alternative point of view is that a is meaningful in its own right, measuring the per capita susceptibility to crowding: the larger the value of a, the greater the effect of density on the actual rate of increase in the population (Kuno, 1991). Now the behavior of a population is seen as being jointly determined by two properties of the individuals within it -their intrinsic per capita rate of increase and their susceptibility to crowding, R and a. The carrying capacity of the population (K = (R — 1)/a) is then simply an outcome of these properties. The great advantage of this viewpoint is that it places individuals and populations in a more realistic biological perspective. Individuals come first: individual birth rates, death rates and susceptibilities to crowding are subject to natural selection and evolve. Populations simply follow: a population's carrying capacity is just one of many features that reflect the values these individual properties take. It is not yet clear, however, just exactly what type or range of competition this model is able to describe. This can be explored by tracing the relationship between k values and log N (as in Section 5.6). Each generation, the potential number of individuals produced (i.e. the number that would be produced if there were no competition) is NtR. The actual number produced (i.e. the number that survive the effects of competition) is NR/(1 + aNt). k = log NtR — log NtR/(1 + aN,), or, simplifying: k = log(1 + aNt). Figure 5.20 shows a number of plots of k against log10Nt with a variety of values of a inserted into the model. 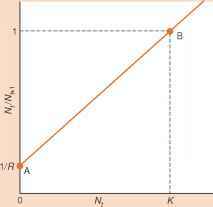 In every case, the slope of the graph approaches and then attains a value of 1. In other words, the density dependence always begins by under-compensating and then compensates perfectly at higher values of Nt. The model is therefore limited in the type of competition that it can produce, and all we have been able to say so far is that this type of competition leads to very tightly controlled regulation of populations. Figure 5.20 The intraspecific competition inherent in Equation 5.13. The final slope of k against log10Nt is unity (exact compensation), irrespective of the starting density N0 or the constant a (= (R - 1)/K). R < 1.33: direct approach to a stable equilibrium R > 1.33: damped oscillations towards that equilibrium. Figure 5.21 The intraspecific competition inherent in Equation 5.19. The final slope is equal to the value of b in the equation. time lag has provoked the fluctuations in the model, and it can be assumed to have similar, destabilizing effects on real populations.